Course Reports – How are your students doing? While keeping track of student progress via the Grade Center, Performance Dash Board and course activities are great tools for encouraging student success, instructors who use Blackboard also have another powerful tool at their disposal. You can access the health of your course by looking at course-wide trends in tool and content use. When you compare these trends to student achievement, you can pinpoint areas of your course that need attention. 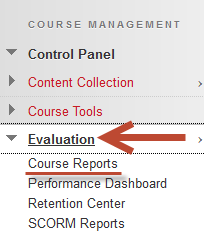 These trends can be found in the Control Panel of your course in the Evaluation section. They are called Course Reports. 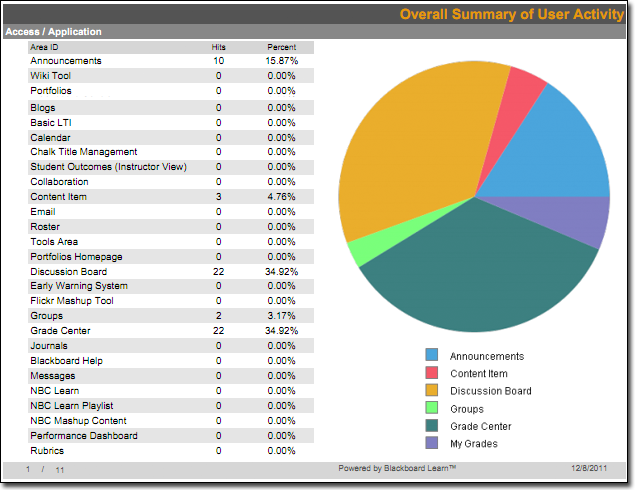 Displays a summary of all user activity inside content areas for your course. Use this report to determine which students are active in your course and which content areas they are using. For example, if you house all your tests in a content area named “Tests,” you can run this report and easily see who accessed this content area and how often over a certain time period. Displays overall activity within your course, sorted by student and date. Data includes the total and average time spent per user. You can also click an individual student’s name to access his or her Student Overview for Single Course report. This report can help you determine which days of the week students are active in your course and see how much time students spend overall. Displays goals coverage information for a single Blackboard Learn course. Data includes both covered and gap values for all curricular areas that the course is associated with, as well as a breakdown of course items that have been aligned to goals. Displays information showing how a single Blackboard Learn course performs against a selected set of goals. Performance targets and a range of acceptable performance for the course can be determined when running the report. Data includes averages for the entire course as well as breakdowns for individual students and goals. Displays user activity for all areas of your course, as well as activity dates, times, and days of the week. Use this report to view student access as well as how often course tools are used. Displays an individual student’s activity within your course, sorted by date. Data includes the total overall time the student spent in your course as well as detailed information about the student’s activity, such as which items and content areas a student accessed. Displays a summary of user activity in discussion board forums for your course. View which students are using which forums and which are most active. Displays a summary of user activity in groups for your course.